In August of 1833; Dexter Mason Ferry was born in Lowville, New York not far from Rochester. He began his career working on local farms at age 16. Agriculture was prospering in this section of upstate New York at that time since the newly established rail lines allowed farmers to quickly get their crops to markets in the large port cities of the eastern seaboard. D. M. Ferry moved to Detroit in 1852 and went to work as a clerk and then as a bookkeeper in a stationery business. But he made a very favorable decision in 1856 when he joined with two partners to establish a seed business in Detroit. The Civil War greatly benefitted their enterprise as did the spread of railroads both for shipping seeds to customers and allowing fertile but previously isolated areas to prosper. By 1865, Ferry was the senior partner. He spent much of the rest of his life expanding the firm. In the late 1870s, he merged with or took over the rival Detroit Seed Company. The firm went national and Ferry purchased competitors throughout the country. In the early decades of the Twentieth Century, D. M. Ferry was the world’s largest firm in the production and distribution of vegetable and flower seeds. Dexter Ferry died in 1907 and his son operated the firm for some decades thereafter. Ferry Street in Detroit takes its name from the farms where the Ferry Company grew its seeds in the late Nineteenth Century. In 1885, Mr. Ferry apparently decided that his superintendent needed an attractive home so he commissioned the Queen Anne style home that you see. At the time it was built, the area was within the city of Detroit but at the outskirts. Dr. William Tracy, a seedman and superintendent of the Ferry seed farms, was the first resident of the home and lived there for 14 years. I believe that he then went to become a professor of horticulture at Michigan Agricultural College in East Lansing. The city grew around the Ferry farms and, in 1907; they closed the farms on East Ferry Street and moved to land near Rochester, Michigan. However, I believe that the seed company owned the home and rented it to company employees for some decades after the removal of the farms. This area along East Ferry Street was platted before the disappearance of the farms but few homes were built in this neighborhood until after 1914. This home is one of the better examples of Queen Anne style architecture in Detroit but other classic examples may be found in the East Ferry Street Historic District. This is known as an Eastlake style Queen Anne residence since it was influenced by the ideas of Charles Locke Eastlake, an English architectural critic who published a widely appreciated book about Queen Anne design in 1868. He promoted colorful styling and the juxtaposition of different colors and materials in housing design. He advocated very complicated and varied exteriors for Queen Anne style homes. The home you see here rests upon a foundation of rough-faced coursed limestone. The first floor was constructed with orange brick and the second floor with octagonal shingles. In between the two floors, there is a cornice with stylized brackets. The roof is interesting for its variety. It is an unusual hip roof with skylights, several decorative gables and a projective chimney stack. The home was designed to be appreciated from all angles and, as the city grew around it, the Ferry Seed Company apparently bought surrounding land so that the home could be appreciated from many angles. By 1930, the Ferry seed growing endeavor had moved to California. Shortly thereafter, the firm merged with the Morse Seed Company and then continued to prosper. In 1981, the Ferry-Morse seed firm was purchased by or merged with the French conglomerate, Groupe Limagrain, to become the world’s largest such business. In 2005, that firm was taken over by the Norwegian firm, Jiffy International which should be confused with the Chelsea, Michigan firm that produces Jiffy Mix. 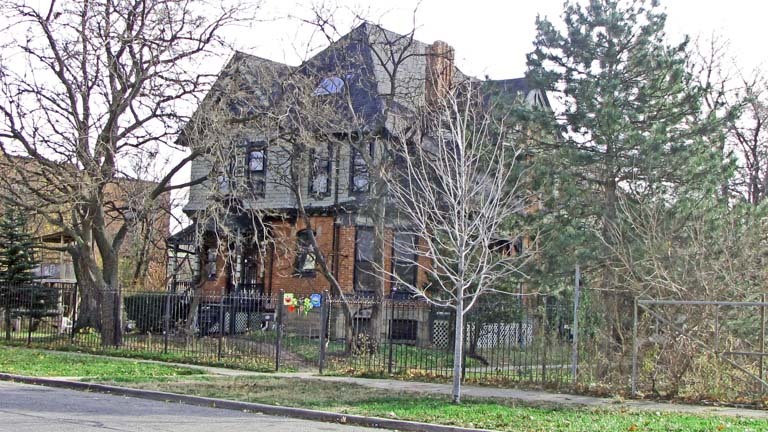 If you visit Detroit’s Cultural Center and the Detroit Institute of Art, it is worth a short walk to see the numerous Queen Anne and Victorian style homes on East Ferry Street and continue to Beaubein Street to see the D. M. Ferry Seed Company’s Superintendent’s Home.